Node.js Everywhere with Environment Variables! (John Papa) - Wow! This awesome post brings you from zero to hero with steps of a extreme clarity. If you are interested in Node.js it a must. ﻿Azure Functions Dependency Injection with Autofac (Jason Roberts) - An interesting tutorial that explains how to improve our functions. ﻿Building a Web App With Yeoman (Oscar Salas) - A very complete and detailed post about yeoman. What it is, what it can do, how to install it. The only thing missing could be one final example to get started. ﻿Testing a WebAPI in .NET Core with Integration tests (Dominique St-Amand) - This post explains a good and simple way to build tests. ﻿Azure Data Architecture Guide (Ed Price) - Nice new book, based on the best practices of the AzureCAT... Yeah. We all need this book! ﻿Updating my ASP.NET Website from .NET 2.2 Core Preview 2 to .NET 2.2 Core Preview 3 (Scott Hanselman) - Really cool "live" post where we follow Scott updating his website. 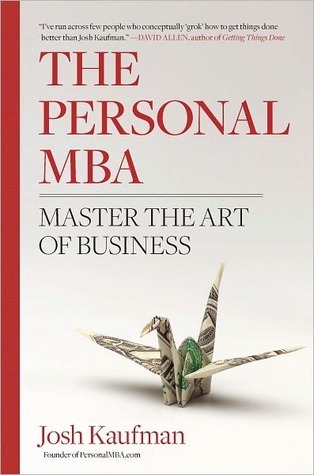 The Personal MBA: Master the Art of Business (Josh Kaufman) - An interesting book that helps to get in the mood, get prepared, and maybe for some whom weren't sure yet about the idea of a personal MBA (compare to the regular one)... Help to start planning and get moving. This book isn't an one book miracle MBA certification, but most likely a really good way to understand the journey the reader is about to start. The complete list of books to achieve this adventure is constantly updated and is available online.